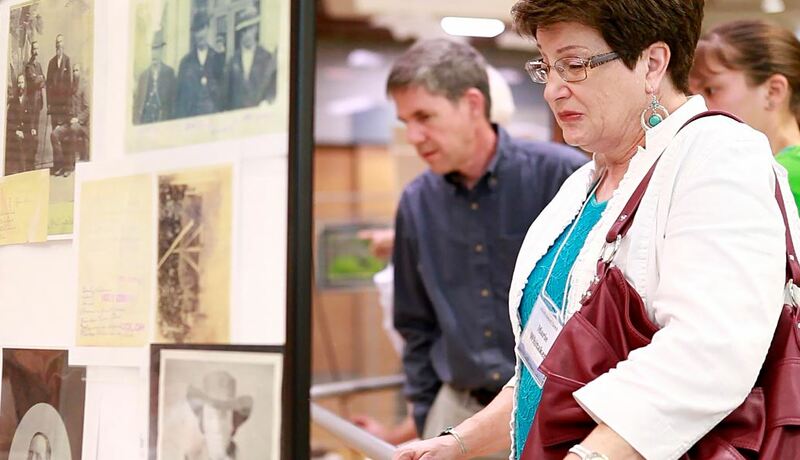 As part of the Egan Symposium there was an accompanying Exhibit of Egan Artifacts. other Egan documents. Another artifact on display was a wooden traveling trunk into which Howard had carved his initials. 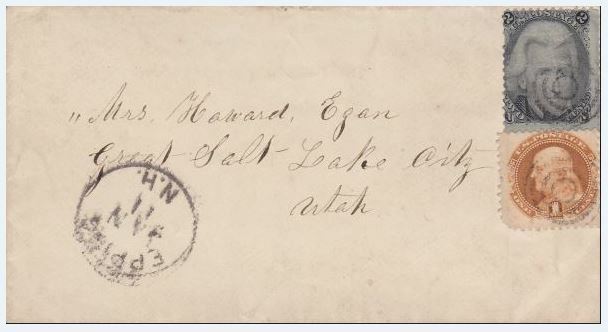 The most valuable artifact, on guarded display, was the original of a payment voucher signed by Joseph Smith authorizing Howard’s pay as a Nauvoo city policeman. 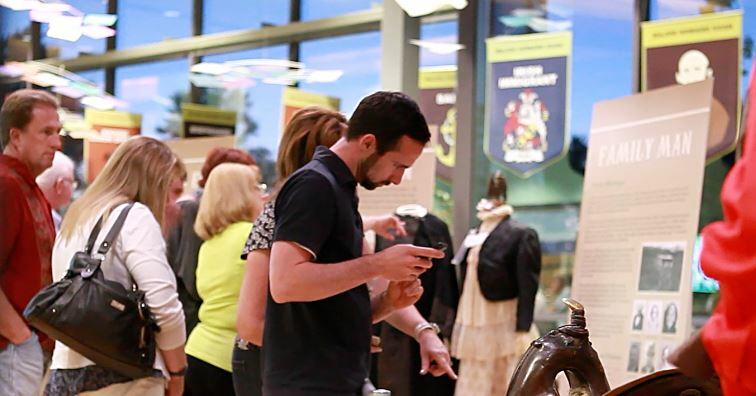 A second exhibit featured Howard’s military life. 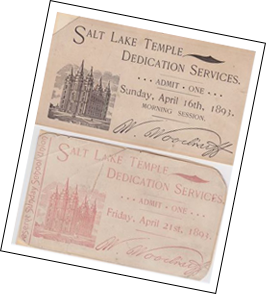 He joined the Mormons at a time of growing antagonism from surrounding settlements. In response, the Nauvoo Legion was formed to defend the city and surrounding Mormon Areas. 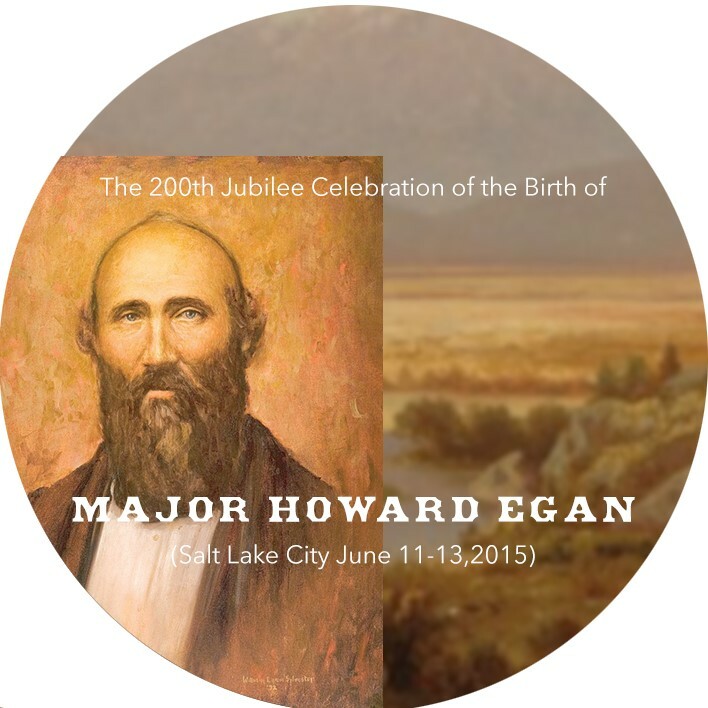 Egan promptly joined, and was made a Major in the Legion. 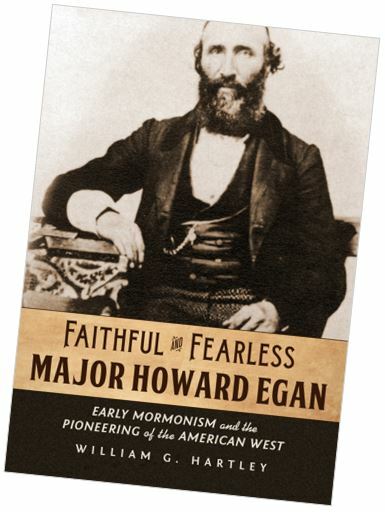 After the revocation of the Nauvoo Charter, the unsanctioned Nauvoo Legion continued to operate under the command of Brigham Young, and Egan was one of Brigham’s trusted bodyguards and couriers. 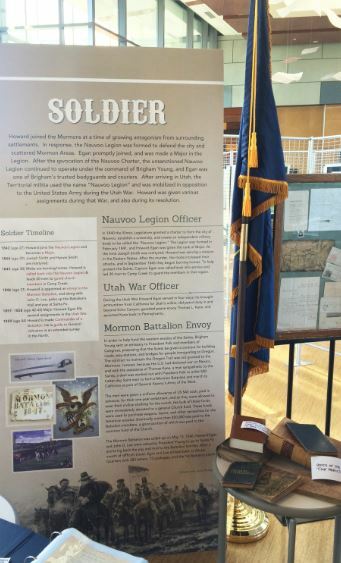 After arriving in Utah, the Territorial militia used the name “Nauvoo Legion,” and was mobilized in opposition to the United States Army during the Utah War. Howard was given various assignments during that War, and also during its resolution. 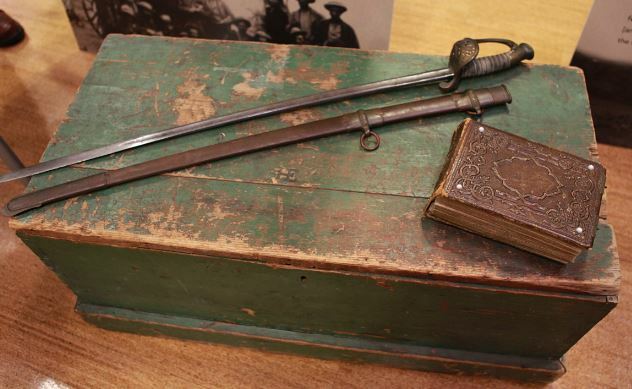 One of the prized artifacts lent for this military exhibit was Major Howard Egan’s Mormon Battalion sword. 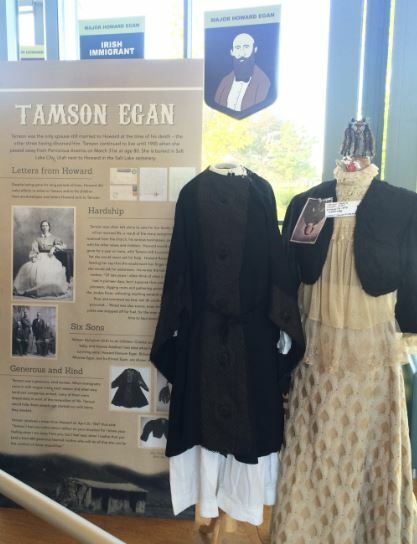 There was also an exhibit that featured Tamson, Howard’s first wife. 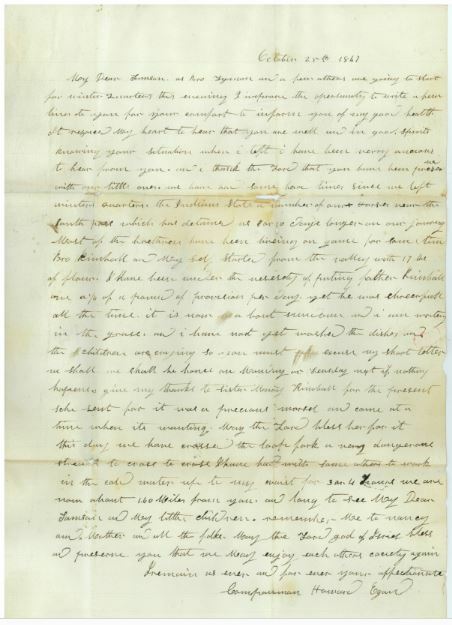 Tamson was left alone to care for her herself and her children during most of her married life as a result of the many assignments Howard received from the church, his various businesses, and time spent with his other wives and children. Howard would sometimes be gone for a year or more, with Tamson left to provide for herself. Yet she would never ask for help. Her son, Howard Ransom Egan, remembered her saying that she would work her finger-ends off, before she would ask for assistance. 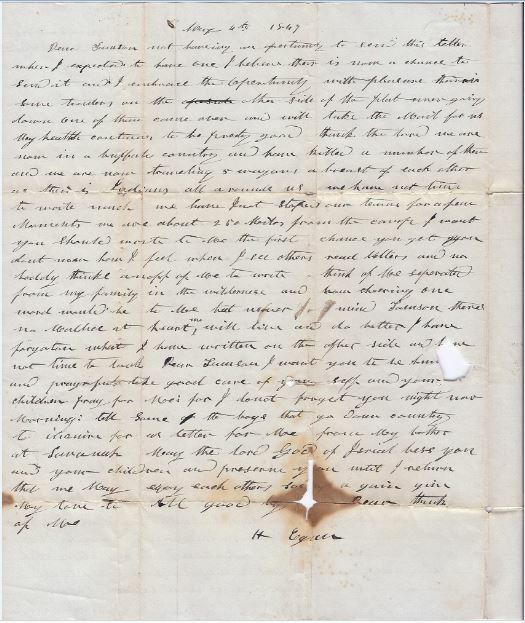 He wrote of her: “Of late years, I often think of what a hard life Mother had in pioneer days, but I suppose that was the lot of all the pioneers; digging roots and gathering greens, catching fish in the Jordan River, collecting anything eatable to make what little flour and cornmeal we had, last till another supply could be procured…. 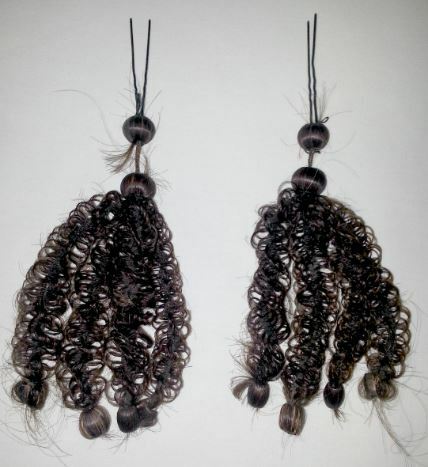 Despite the hardships, Tamson had some beautiful clothing for special occasions, the originals of which were on display, including fashionable hair extensions. Because Howard was gone for long periods of time, he wrote her periodic letters. A number of those letters were on also on display. 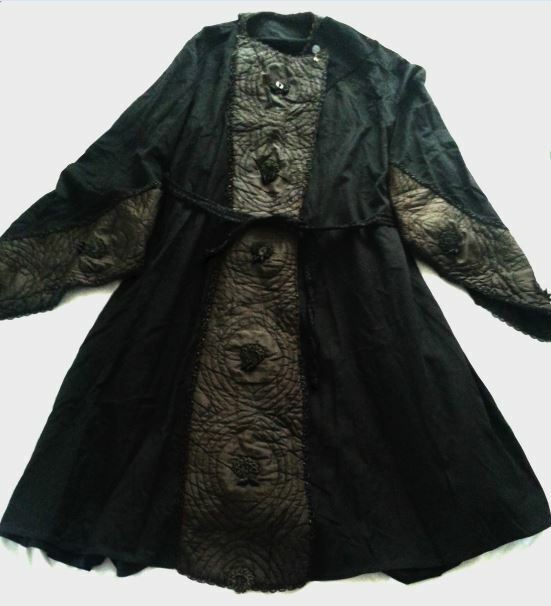 Tamson was a generous, kind woman. When immigrants came in with wagon trains each season, and when new hand cart companies arrived, many of them were desperately in want of the necessities of life. Tamson would help these people get started out with items they needed. 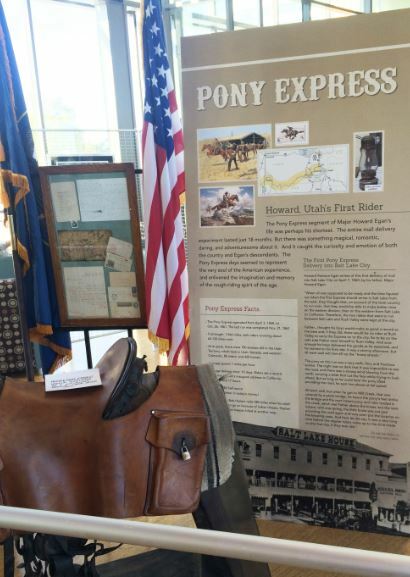 There was also an exhibit that featured Howard’s role in the Pony Express. 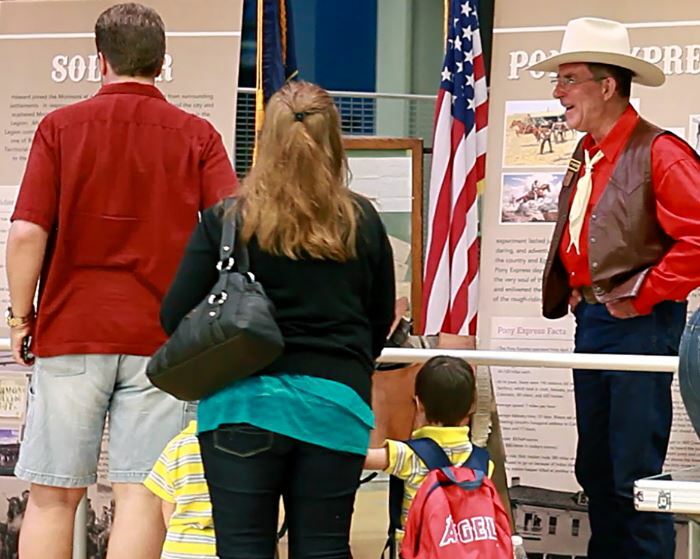 The lives of Howard and his sons Howard Ransom and Richard Erastus are probably best known for their Pony Express participation. All three were riders, but the sons rode the most. 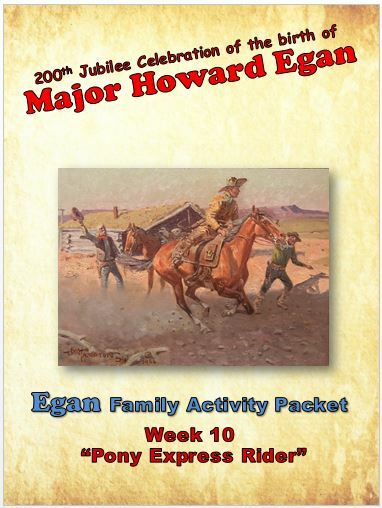 Howard managed the Pony Express division, its stations, riders, and remounts for 322 miles in western Utah and eastern Nevada desert regions. 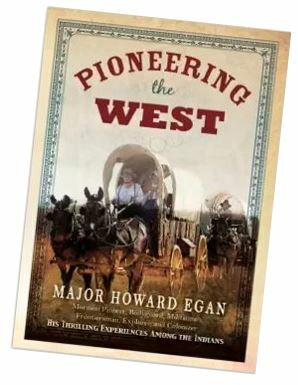 Two noted historians of the Pony Express said of newly-hired Howard, that “his knowledge of the West was inferior to none.” Howard’s district occupied the most difficult and dangerous division on the whole Pony Express line. There were also photographs of Howard’s wives and children, and copies of correspondence between them. 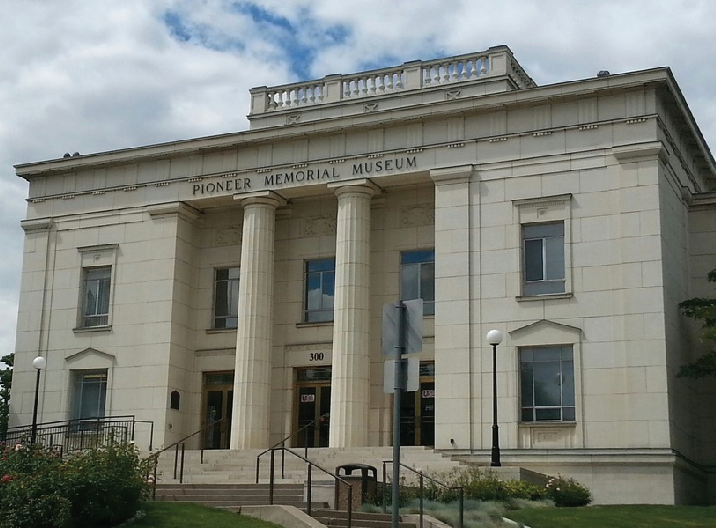 The Pioneer Memorial Museum (also known as the “DUP Museum”) features memorabilia from the time the earliest settlers entered the Salt Lake Valley in 1847, until the joining of the railroads at Promontory Point in 1869. 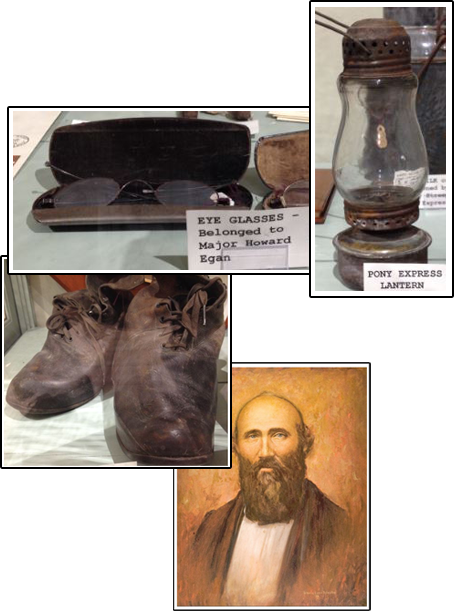 The museum exhibits a number of Egan related artifacts, including: Major Howard Egan’s wooden traveling trunk; his eye glasses; his Pony Express lantern; his tombstone; an oil painting of him; land deeds for property he owned; and letters he wrote and received. 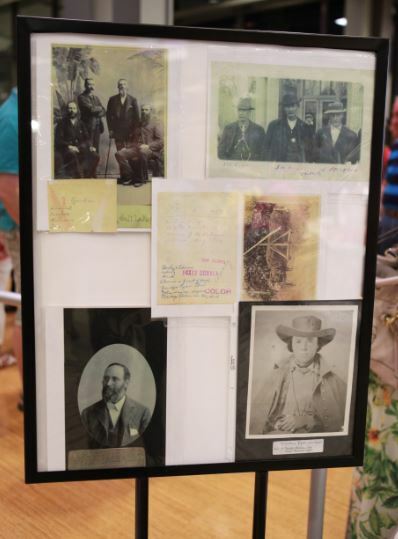 The museum also exhibits the boots specially made for Howard Ransom Egan, who was crippled and rode for the Pony Express; an oil painting of son, Richard Erastus Egan; and a watch chain made from the hair of Nancy Redden Egan. Click–HERE for a MAP of the DUP Museum, identifying the location of Egan artifacts, prepared for the Egan Celebrations by Adam Egan.